Okay, yes, I’m on a storage kick these days. Have I mentioned that our house is kind of small? With very few surfaces on which to put stuff? I bought a much-needed jewelry box the other day, and when I got it home I realized there was no place to put it. Seriously. The only real surface is our dresser, which is now in the baby’s room serving as a changing table. So I started thinking about alternatives, and came up with an idea for the jewelry frame, above. 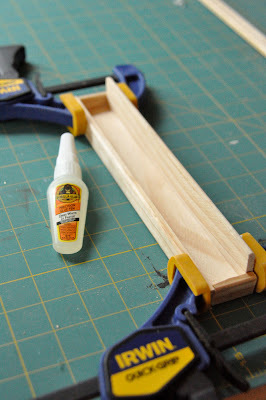 I found an old frame at the Alameda Flea Market, and bought the other supplies at our local hardware store: 1/2 plywood backing cut to size, hooks and screw eye hooks, a couple screws, 1/4″ wire mesh and wire cutters, stapler, gorilla glue, some scrap molding for the box and white paint. I started by measuring out the layout, considering the length of the necklaces I had, how many earring hooks I wanted, and where I wanted the mesh screen placed. 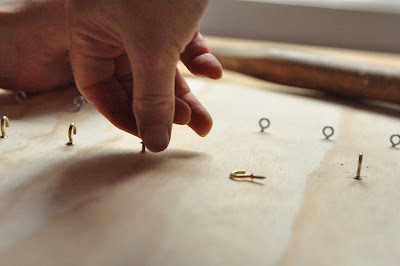 Then I screwed in the hooks, staggering the earring hooks and necklace hooks so that they wouldn’t interfere. I made a little box for post earrings and rings out of the scrap molding, and glued it together with gorilla glue and clamps. Then I screwed it to the backing. The screen was stapled to two small strips of the molding and then glued to the backing (I painted underneath the screen area first). 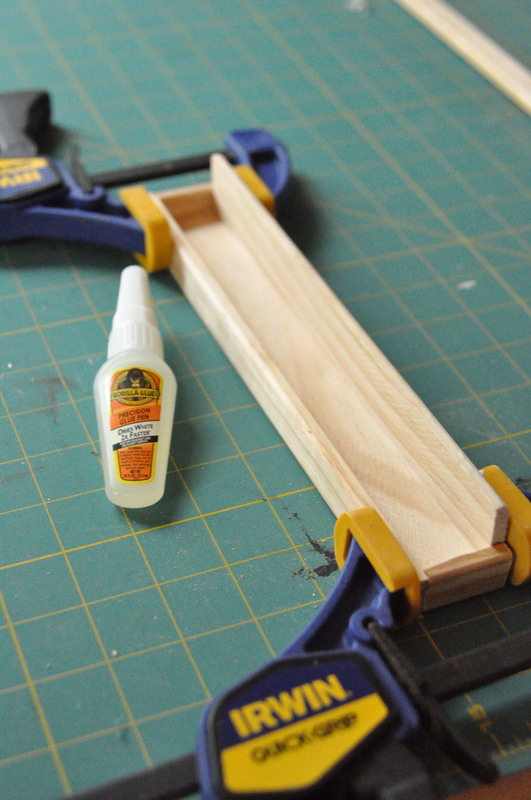 I glued the plywood backing to the frame using the gorilla glue, and then painted the whole thing white. I really like the way it turned out, and now I finally have a convenient, accessible place for my jewelry that doesn’t take up surface area! that is awesome! I've seen them with just mesh but I think this looks nicer and offers storage for more than just earrings. I will be making this soon! this has to be the best jewelry frame i have seen yet. thanks so much for sharing. i think i'm going to have to try it out when i get a chance. 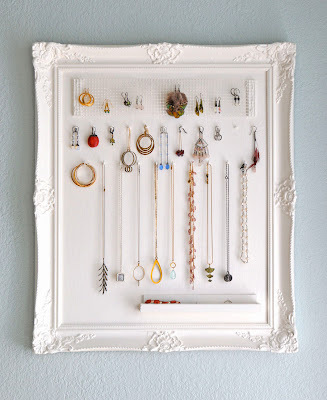 This is one of the best jewelry frames I have seen. It’s very beautifully designed. You find enough space to store your jewelry. Thanks for sharing the idea of how to design it. I am surely going to make it soon then share my experience with you. Great job! As a jewelry designer I'm always looking for new storage ideas for my clients. I've pinned this to my Pinterest and plan on making one in the future! Thanks for posting! 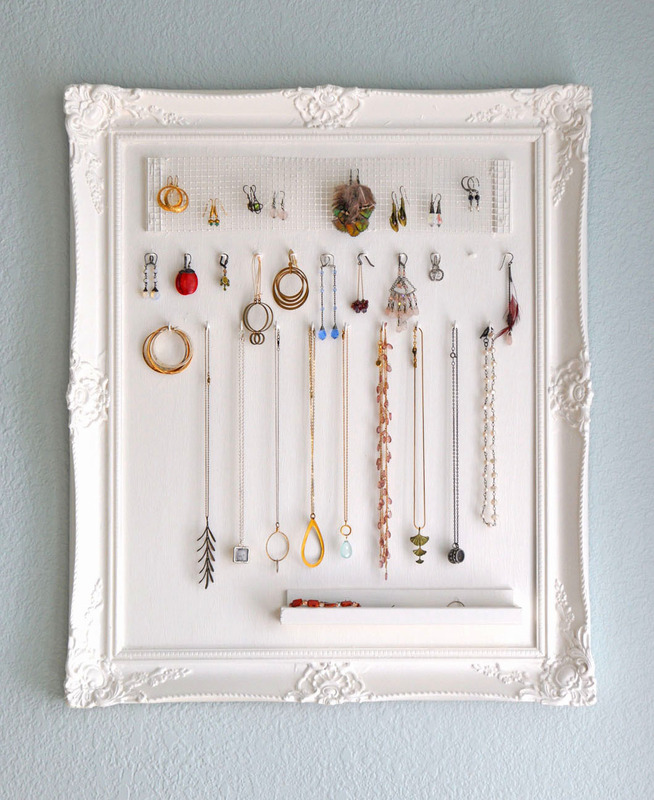 Oh my gosh, this is the best diy jewelry holder ever! It includes every aspect of holding your jewelry, unlike most wall hanging options. LOVE it!!! Can't wait to try it out!! Oh my. Yours is lovely. I used an antique stand-up frame (no paint). Instead of board, I used a piece of rigid foam. The thin kind with a sticky back. Leaving the backing on, I poked holes the size of my post earrings. 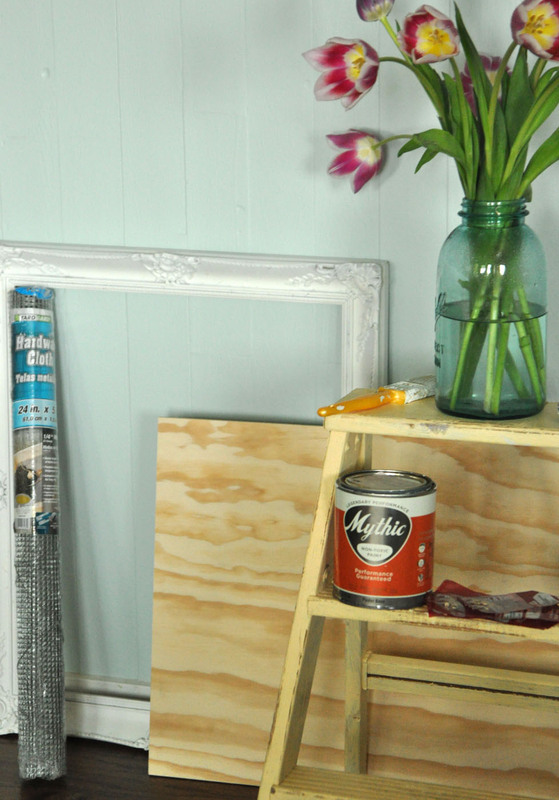 Works great and the frame is a great match with my antique dressers. Mesh is a great idea. Love your idea of using the rigid foam. Can you tell me how thick yours was and where purchased it? Thanks! This is fabulous! 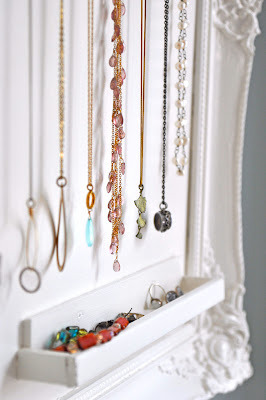 It looks so cute 🙂 I need a new jewelry storage of some kind, and will definitely give this a go 🙂 thanks for posting. I thought this was so cute…I made one and I get a lot of compliments! Thanks so much for posting so I could copy such a cute idea! 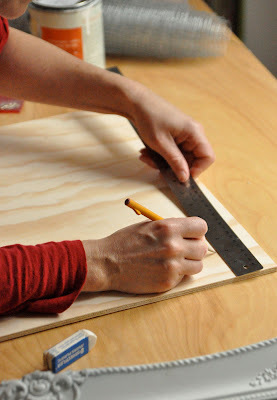 I am currently working on constructing this as a Christmas gift for my sister. I found that it was difficult to paint after inserting the screws, so I used white spray paint instead of regular paint. Worked like a charm! certainly going to make this very soon! very neat and stylish! 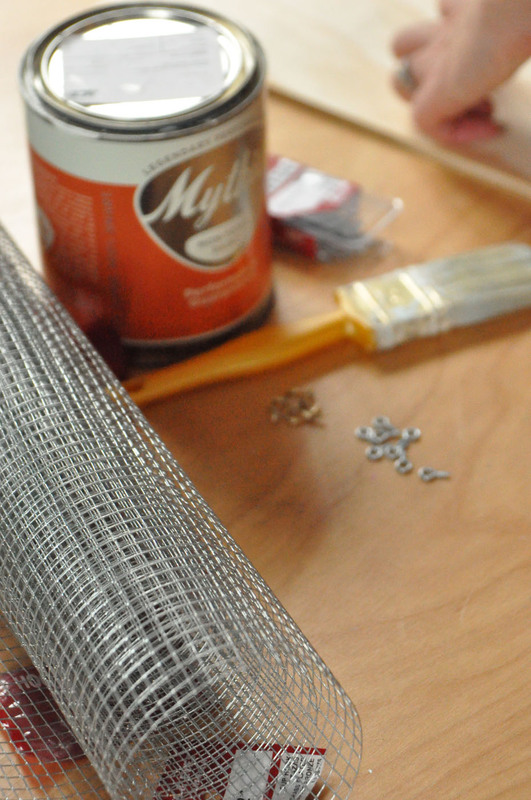 I may be dense, but I can’t figure out from the instructions or the pictures where or how you use the wire mesh. It seems like with the hooks and screw-eyes you wouldn’t need it. Help me out here. I used a strip of mesh raised on little wooden strips as a surface to easily hook earrings. It’s at the top of the frame, and you’re right, I didn’t picture it being applied. I glued the wood strips (just about 3/8″ thick) and then stapled the screen to those. You can also hook them through the actual hooks, but with the mesh you can store a lot more of them, and you don’t need to be as precise when hanging them. Not necessary, of course – just an easy alternative to more hooks. Hi Jennifer! I love this simple idea! The white is so bright and doesn’t distract from the pretty jewelry. Perfect. I included this project in my 15 DIY Jewelry Organizers and Displays. http://www.missloviecreations.blogspot.com/2014/01/15-diy-jewelry-organizers-and-displays.html I hope you’ll come check it out and grab a button if you like. Have a great rest of your weekend! This is so great! I am definitely going to make one for my girlfriend’s birthday! i have a question about screwing in the hooks and eye hooks.. do i need a drill to put them in or is the plywood soft enough for me to just hand screw them in? Sorry, just haven’t made any projects using them before. thanks! Hi Shannon – you should be able to just tap them in with a hammer and then twist. The hard part is just getting them started, but it should just take a few twists by hand once the teeth catch. Thanks for your sharing to make jewelry storage. It is very nice and easy to create it. I am going to make it later with your guide for little girls.